Santa Monica Press, 9781595800701, 336pp. Exploring the film settings of one of the most popular comedy teams in American history, "The Three Stooges: Hollywood Filming Locations" documents the sites of the Stooges' most famous Columbia Pictures short films made in and around Hollywood between 1934 and 1958. Featuring exclusive quotes from the Three Stooges' directors, supporting actors, and family members, this collection is a treasure trove of memorabilia for the Stooges fan and an important document in Hollywood's cinematic history. 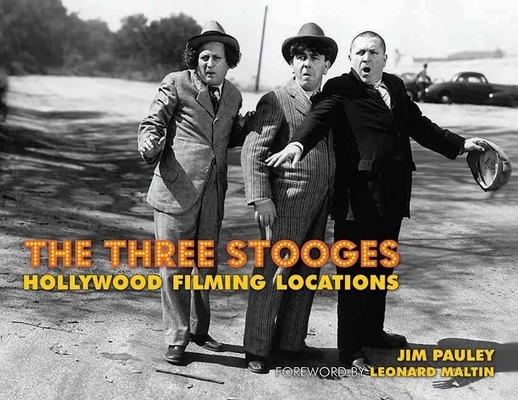 Jim Pauley is a recognized expert on the Three Stooges filming locations, having written articles on the subject since 2001 for the Three Stooges Journal, a publication by the Three Stooges Fan Club. Pauley has also presented on this topic at the Hollywood Heritage Museum and the Stoogeum, a Three Stooges museum in Pennsylvania. Pauley lives in Philadelphia. Leonard Maltin is a film critic and historian who serves as the film correspondent for Entertainment Tonight. He lives in Los Angeles.